In any enterprise that deals with engineering product development, applications like ERP must interface with the product’s engineering model data seamlessly, and in real time, to sustain the rapid pace of product development. ERP companies often use CAD connectors running as plug-ins inside CAD systems to extract product information from a CAD database and provide it to the ERP systems. This requires the process to be initiated from the CAD side rather than from the ERP end, thus running the risk of the ERP system being out of sync with the CAD data as the “connector” process is manual and static in nature. ERP companies are also at the mercy of the CAD software companies who provide access to CAD APIs for development of the connector software. As CAD companies also double up as Product Lifecycle Management (PLM) technology providers, and the considerable overlap between PLM and ERP functions in the engineering environment, they are increasingly averse to licensing their APIs to other enterprise application providers. And when they do, if they do, since each CAD company uses a unique database and corresponding API, ERP companies are forced to develop multiple CAD connectors to remain competitive. It is for these reasons that enterprise applications must develop solutions that can access CAD data from multiple systems independent of CAD APIs. Such a solution would consist of a single API that can be quickly integrated into any enterprise application to provide access to data from multiple CAD systems like CATIA, NX, SolidWorks, Solid Edge, Creo, and Inventor without requiring any of those CAD licenses or having to create individual connector software. That’s exactly where CCE's Oceans SDK comes in. 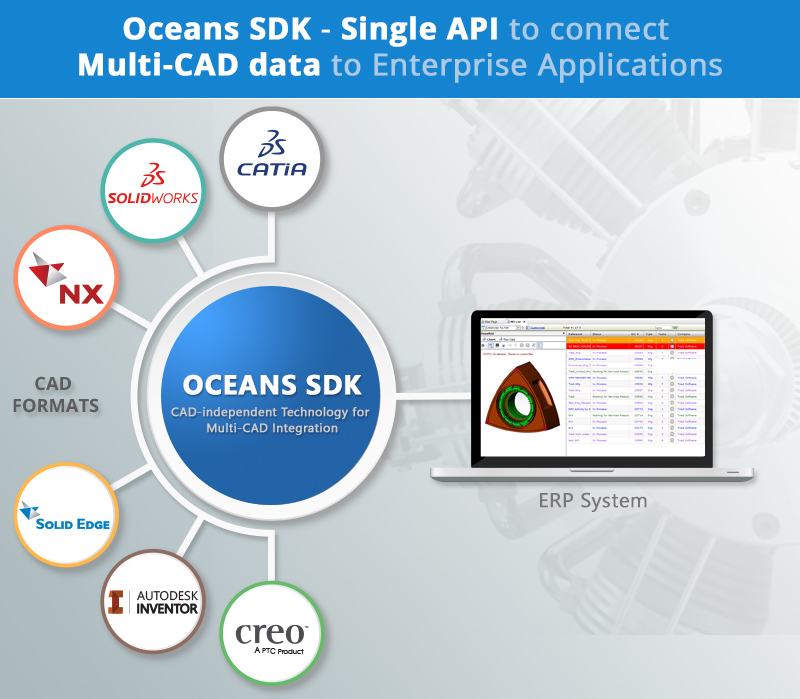 Oceans SDK is CCE’s CAD-independent technology that allows easy integration of 3D CAD data assets in enterprise applications, providing a unified solution to dynamically access product data from all major CAD systems. This ability permitting dynamic access to CAD data on an as-needed basis throughout the company gives enterprise application vendors a significant competitive advantage. Based on market needs, ERP vendors would need to decide the depth of integration they want to achieve with CAD. Simpler integrations might mean the ERP system manages only critical data such as part name, number, and product structure, while the CAD data access tool provides a real-time connection to other CAD data. In deeper integrations, ERP systems could leverage the complete functionality of the CAD data access tool to actively manage the CAD data, including configurations, visualization, file references and in cases to even propagate changes done to file properties in the ERP software, back to the CAD side, thereby updating the source CAD data and repairing broken file references. This leads to reliable synchronization between engineering and manufacturing data. But regardless of the level of integration, seamless connectivity between the design tool (CAD) and the resource-management tool (ERP) is crucial for an enterprise’s long-term success. Shaded with Edges is not working for sample files of NX, SE, SW and JT.Also will be there any information available that what version of specific CAx software files can be viewed with it?